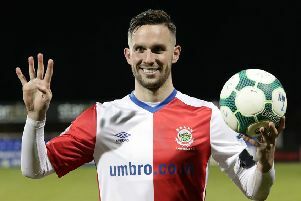 Linfield manager David Healy praised striker Andrew Waterworth after he hit four goals as Linfield hammered Dungannon Swifts 5-0 to move nine points clear at the top of the Irish Premiership table. 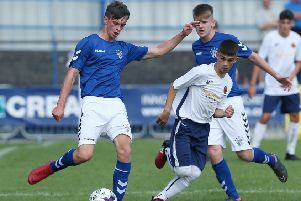 Jimmy Callacher grabbed the other for the Blues and manager Healy admitted that Waterworth is worth his weight in gold. “He is a big player and all the success we have had since I have been to the club Andy has been at the heart if it. “He is a big player and he pops up with important goals. He should score more goals as he gets himself into great positions. “The delivery of the crosses tonight were very good and Andy is the man you want on the end of them. “When you need big goals Andy is always there to score. I took him off because the game is won and we have a few guys on cautions and you don’t want anyone missing the big game against Ballymena United. “Andy has played lots of football and the reason he plays lots of football is because he is a good player and he scores goals. And Healy is looking forward to the big clash with second placed Ballymena in the first game after the split. “It is a big game and we are looking forward to. Ballymena have had a great season under a manager who is known for success in the league. “So we will go down there under no illusion as to how hard it is going to be. “We are looking forward to the challenge,” said Healy to BBC Northern Ireland. And the Linfield manager was pleased with the manner of their win against Dungannon.